Set in prime Berkshire Downs walking country, in sight of the famous White Horse of Uffington, this former chapel is ideal for a family group or two couples looking for a break in the country. 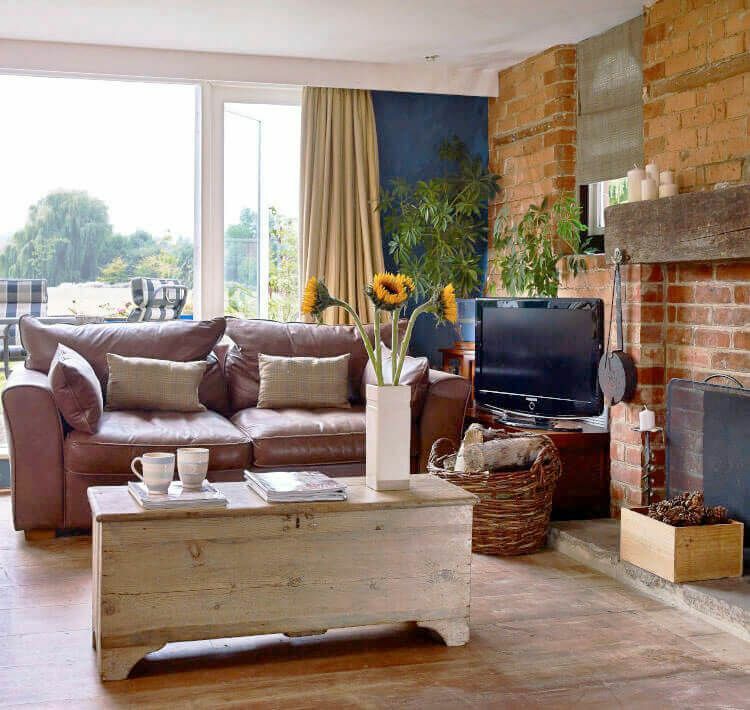 Exposed brickwork, open log fire and rustic oak floors are all mixed in with luxury touches, big snug beds and stunning views. The ideal setting for Autumn and Winter breaks, a New Year gathering or Christmas morning – quirky little touches add to a wonderful atmosphere and the open fire and very comfortable beds make a cosy base. 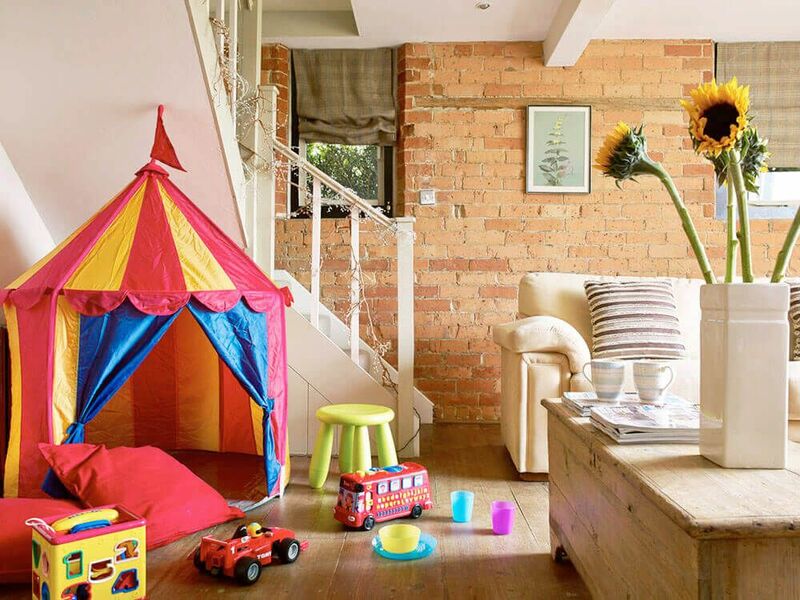 Mini guests are well looked after with a lovely selection of toys, books and and U rated DVDs, plus a play tent that can be used indoors or outdoors. There’s a ‘Good Food’ award-winning pub, The Blowing Stone, within a half an hour’s walk, as well as The Fox & Hounds in Uffington, a 10 minute walk away. There are some excellent walks in the area; the back garden leads to open fields and walking paths and the National Trust Ridgeway is nearby. The nearby village of Uffington has a very handy general stores, which is also a post office and off licence. Close to the villages and towns of Uffington, home of the museum of Tom Brown’s school, Faringdon, Kelmscott, home to the William Morris house, and the picture-postcard village of Burford. In striking distance of all the main destinations: Stow-on-the-Wold, Bibury, Cirencester and Bourton-on-the-Water. The dreaming spires of Oxford are also half an hour distant. Sitting room with open log fire and French windows to the terrace and garden. Kitchen with dining table and two pew benches seating four. 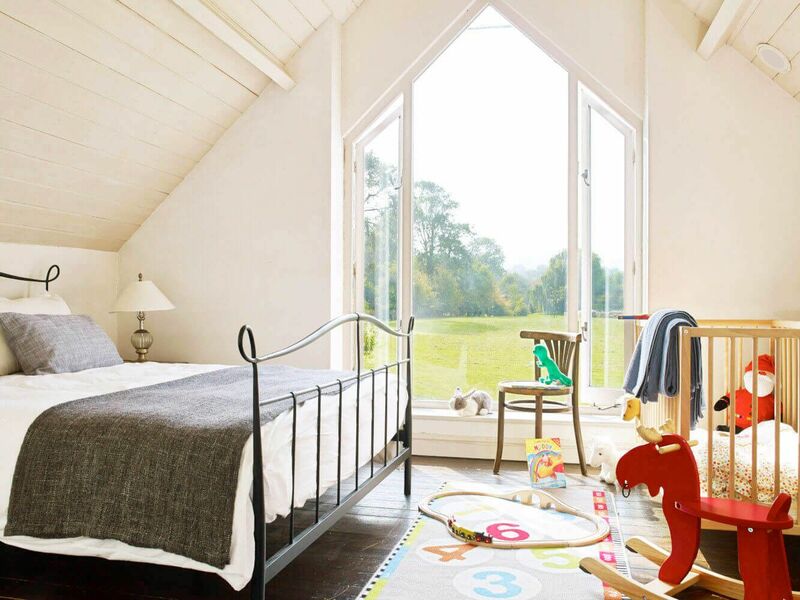 Master Bedroom with a 5′ king-size bed, TV with Sky and lovely country views through the huge picture window. There is space for a wooden cot (on request). Family bathroom with a bath and separate shower. 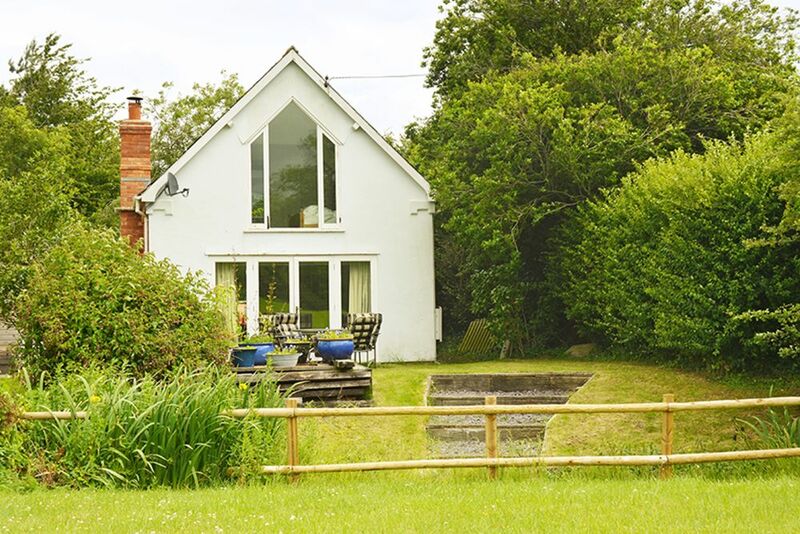 If you're looking for peace and tranquillity then this former chapel is perfect! Combining expansive scenic views, a delightful open log fire and quirky little touches. The Old Chapel is sure to soothe the soul. Aptly named, The Old Chapel has been beautifully converted to mix the old and new, with original features and elegant contemporary furnishings. 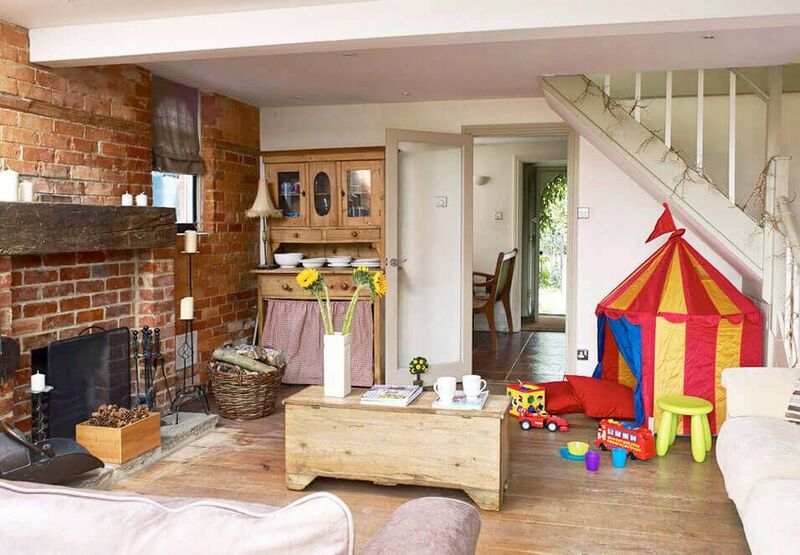 Located in a quiet, peaceful hamlet with a backdrop of the synonymous Uffington White Horse it's perfect for a family of four or two couples (plus their pet pooches!) looking for a break in the country. Exposed brickwork, open log fire and rustic wooden floors are all mixed in with luxury touches, big snug beds and stunning views. 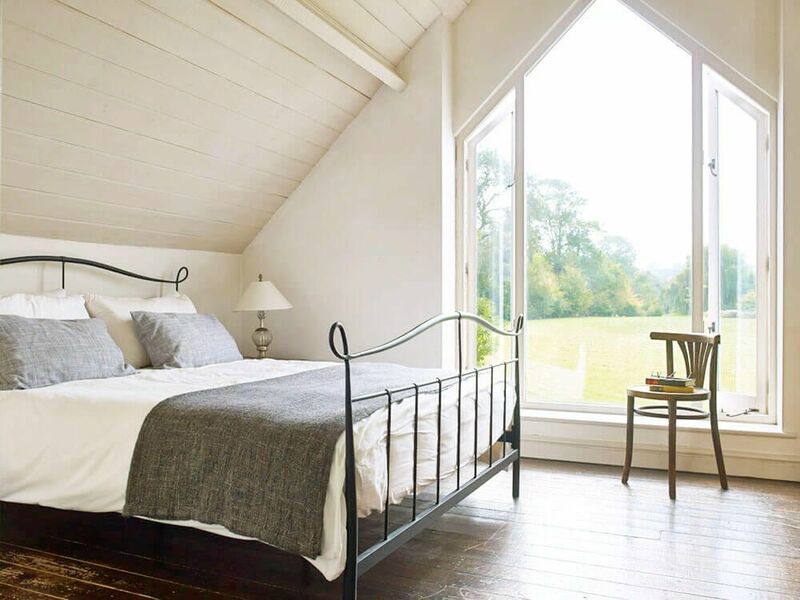 Huge picture windows in the bedrooms and living areas frame the unspoilt views over the beautiful Berkshire Downs countryside. 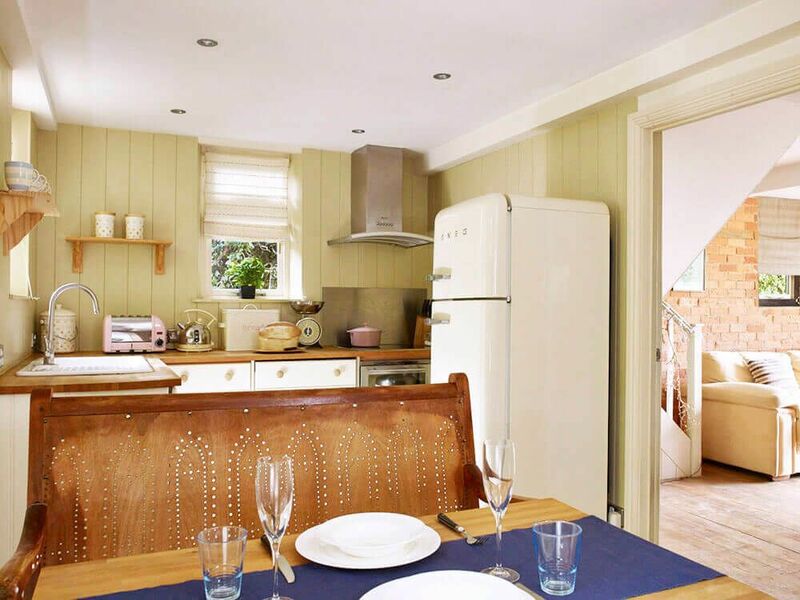 The well-equipped kitchen with a wooden dining table and pew benches is a very sociable space. 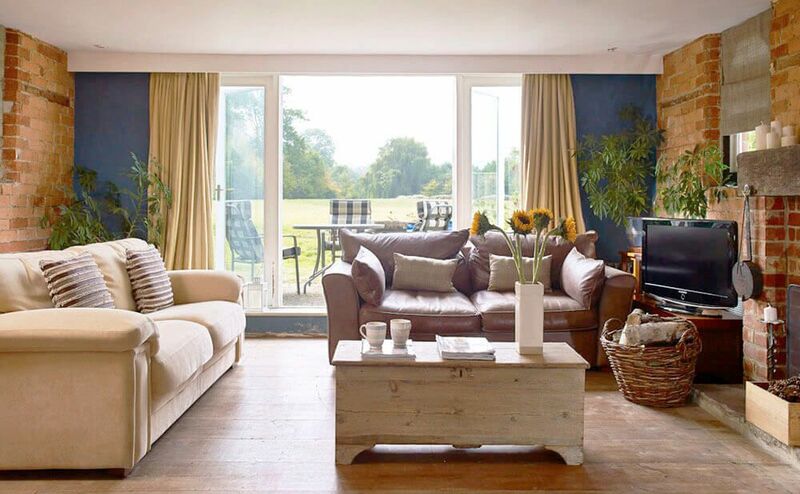 The light and airy sitting room boasts luxurious sofas, a cosy laid fire and French windows overlooking rural bliss. Upstairs, the two sumptuous double bedrooms have very comfortable beds and share a bathroom with a bath and separate shower. 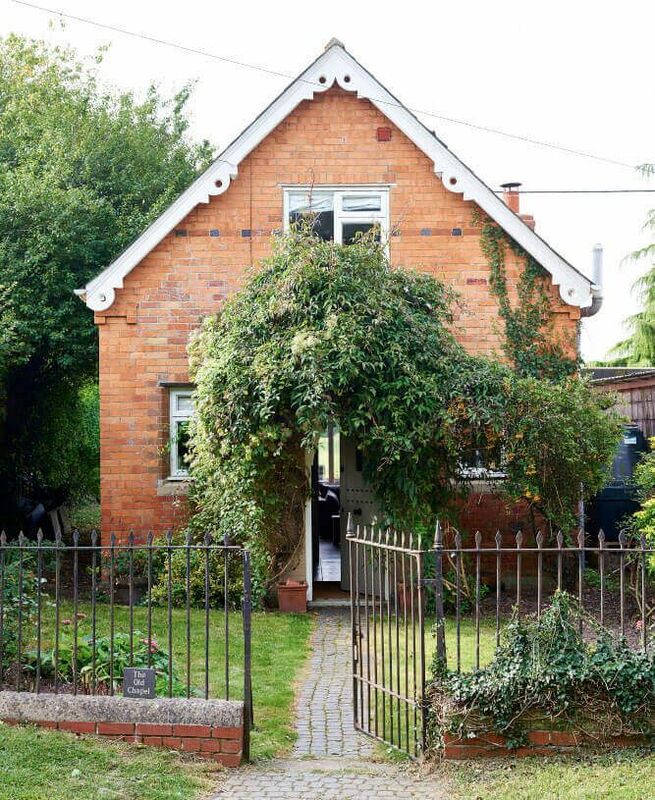 In wonderful surroundings, there is a delightful cottage garden with paved path to the front and a small back garden with a tiny stream overlooking fields. 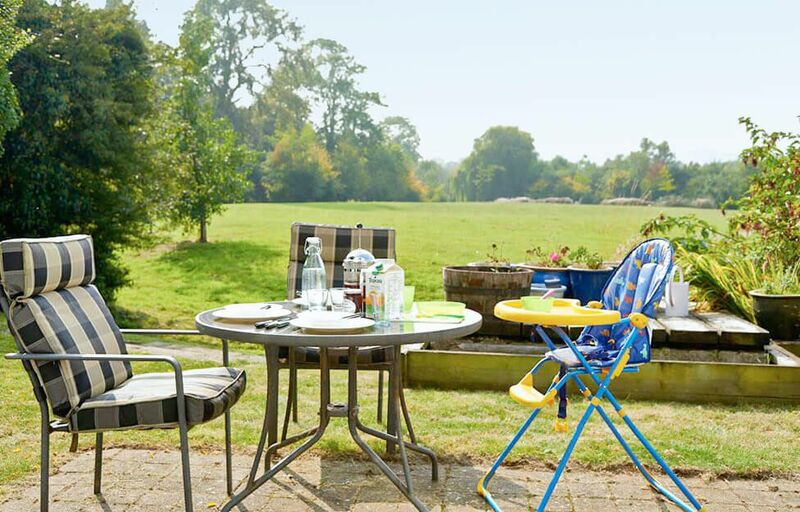 Complete with seating and a barbecue, the garden is ideal for alfresco dining in the summer, or simply relaxing in the peaceful atmosphere with a refreshing drink. 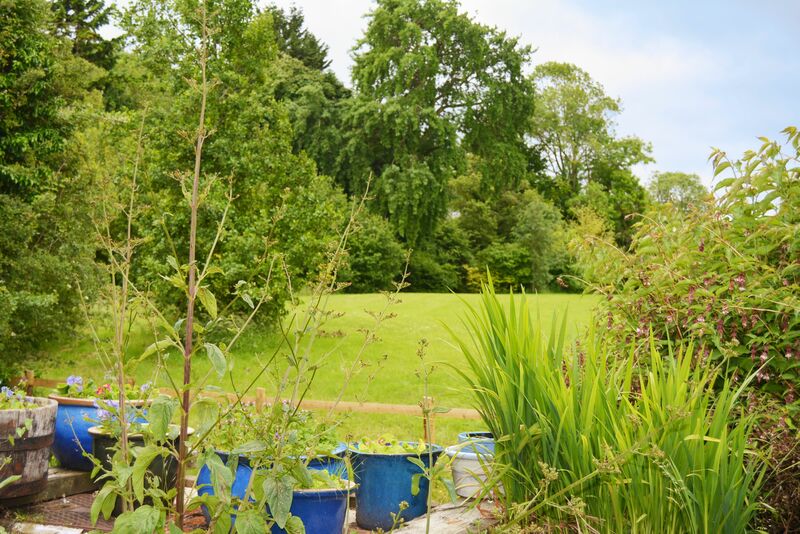 The back garden backs onto a public pathway and bridleways that link you to the picturesque village of Uffington and the Berkshire Downs, and some nice pub stops for you too! 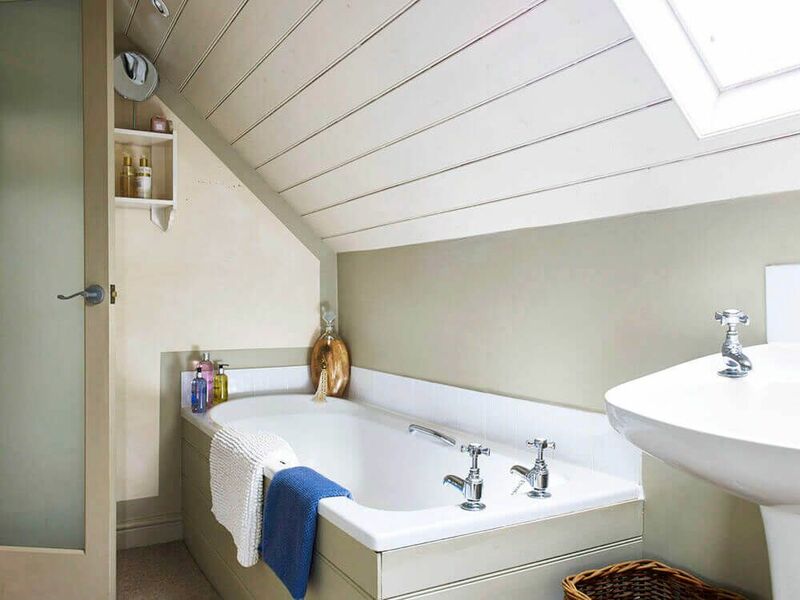 This charming and characterful cottage, in the middle of the Vale of the White Horse, is in sight of the famous White Horse of Uffington and just a few minutes drive from the bustling market town of Faringdon. The Fox & Hounds in Uffington is a ten minute walk away and there’s a ‘Good Food’ award-winning pub, The Blowing Stone, which is about half an hour’s walk. You’re also close to the National Trust Ridgeway for longer hikes. There is an abundance of quaint, pretty, picturesque villages and historic market towns waiting to be explored together with Blenheim Palace, Kelmscott Manor and the Cotswold Wildlife Park. Oxford, the oldest University City in England (21 miles), boasts interesting Botanical Gardens, museums and libraries, and plays host to many festivals and markets throughout the year. Within easy reach you can encounter the wildlife at the Chimney Meadows Nature Reserve, the pretty village of Bampton, used in the filming of Downton Abbey, the medieval riverside town of Witney, the attractive market town of Marlborough and The Cotswold Water Park. The beautiful town of Burford on the river Windrush is 21 miles away and the Roman city of Cirencester 26 miles. 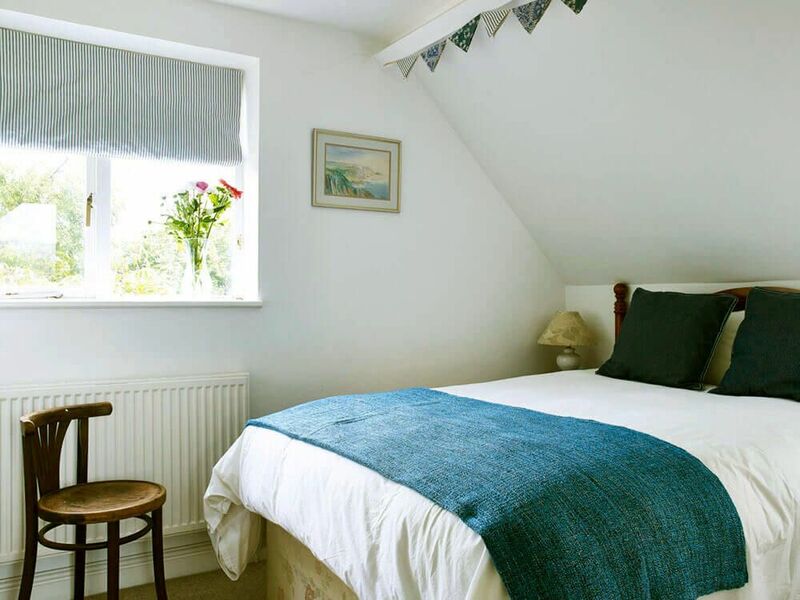 2018-09-01 C Gowing, Pembrokeshire "A cosy and friendly little place with the most comfortable beds I've ever slept in. Place could do with a bit of TLC - bit tatty in places and some water leaks in rain, as well as some basics like light bulbs needing replacing - but it still felt like a very homely and comfy home for the week. Good communication and easy remote check-in process." There’s a ‘Good Food’ award-winning pub, The Blowing Stone, about half an hour’s walk away as well as an excellent pub, The Fox & Hounds pub, a 10 minute walk up the road in Uffington. For shopping, there’s a fabulously well-stocked general store with post office and newsagents within a mile of the cottage in Uffington. Faringdon (6 miles) has a great selection of shops, a number of supermarkets and restaurants including a highly rated Thai restaurant, which offers takeaway – perfect for a relaxing night in! Several lovely Cotswolds towns filled with boutiques, bistros and delis are within half an hour’s drive. Marlborough, is a lovely Wiltshire town 30 minutes’ drive away that has some excellent shops and restaurants. Also well worth exploring is Lechlade-on-Thames with it’s unique Christmas shop open all year round! Serious shopaholics won’t want to miss the designer outlet ‘villages’ at Swindon (14 miles) or Bicester (30 miles). The Polly Tea Rooms, High Street, Marlborough (18.5 miles). The Upton Smokery, just outside Burford (20 miles), is a family business specialising in smoked meat, game and fish of the highest quality. The Cotswold Cheese Company sells more than 80 different artisan and farmhouse cheeses in each of three shops, in Burford (20 miles). Huffkins Bakery and Tea Rooms, Burford (20 miles) make delicious patisseries and cakes to eat in or take away. Maison Blanc, Burford (20 miles) is renowned for breads, fresh pastries, cakes and French patisseries. Made by Bob, Cirencester (25 miles), is a high quality deli and also a nice restaurant in the town of Cirencester. Bicester Outlet Shopping (30 miles) is a chic outlet shopping village with 130 top-name boutiques, restaurants and cafes. UFFINGTON village is in the middle of the Vale of the White Horse. 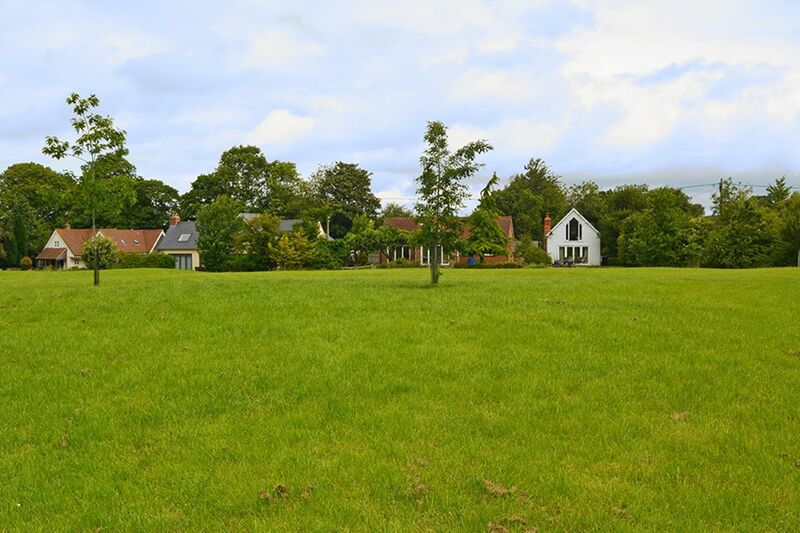 There are public pathway and bridleways from the back of the garden that link you to this picturesque village, home to Tom Brown’s School Museum which contains exhibits devoted to the author Thomas Hughes (1822-96). Hughes set the early chapters of his Victorian novel ‘Tom Browns Schooldays’ here. 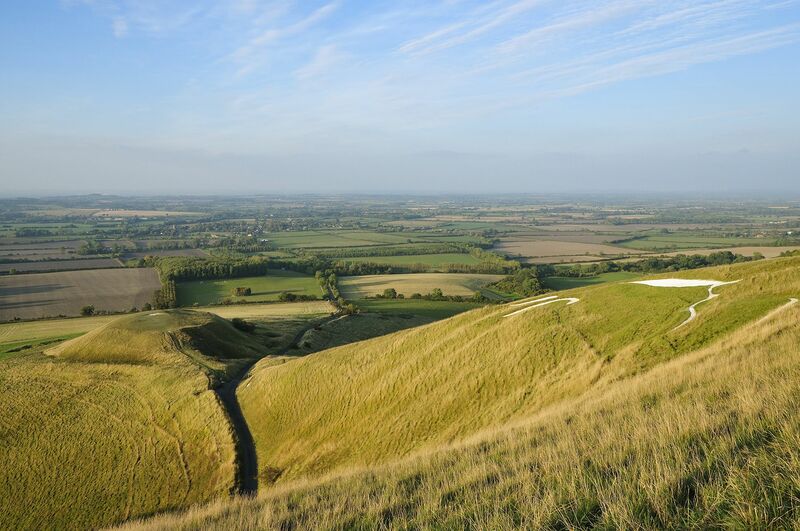 The famous White Horse of Uffington is believed to be Britain’s oldest hillside carving, dated at around 1000 BC. Nearby is the iron Age hill fort, Uffington Castle and a mile west along the Ridgeway is an even older monument, a large Stone Age burial mound which is known as Wayland’s Smithy. BAMPTON (16 miles) is a pretty village and the setting for the filming of the exterior scenes of Downton Abbey. WITNEY (18 miles). Nearby is Cogges Manor Farm museum, a popular filming location and featured as Yew Tree Farm, where Lady Edith’s child was looked after by the Drewes, in the ITV drama series Downton Abbey. MARLBOROUGH (18 miles) market town is well worth a visit and has a wealth of shops and restaurants in its High Street. Do make time to take tea in The Polly Tea Rooms. Market days are Wednesdays and Saturdays. Marlborough was an important staging post on the road from London to Bath and attractions include The Merchant’s House. BIBURY (20 miles) is a picture perfect Cotswold village, set in a conservation area, nestling on the River Coln and home to Arlington Row, the most photographed and beautiful cottages in the country, now owned by the National Trust, as well as Bibury Trout Farm and the Saxon Church, the Church of St Mary. OXFORD (21 miles), the oldest university city in England and sometimes called ‘The City of Dreaming Spires’, has an abundance of prestigious attractions, including the 38 colleges of the university (half of which date back before 1600), the Radcliffe Camera, the Bodleian Library, Ashmolean Museum and Pitt Rivers Museums, and Botanic Gardens. Christ Church Cathedral and College is famed for its connections with ‘Harry Potter’ & ‘Alice’. AVEBURY (26 miles). Attractions include Avebury Stone Circle, the world’s largest prehistoric stone circle (National Trust), the Alexander Keiller Museum (National Trust), Avebury Manor and Garden (National Trust) and Windmill Hill (English Heritage). WOODSTOCK (26 miles) is a picturesque, historic market town with access to Blenheim Palace, the birthplace of Sir Winston Churchill. CIRENCESTER (26 miles), known as ‘The Capital of the Cotswolds’, boasts a rich and well-preserved heritage with a Roman Amphitheatre, Corinium Museum and St. John the Baptist Church. The Brewery Arts Centre offers visitors a unique arts and crafts shopping experience or visit The Bathurst Estate & Cirencester Park, home to Cirencester Polo Club where some of the highest levels of polo can be seen. BOURTON-ON-THE-WATER (31 miles), known as the ‘Venice of the Cotswolds’ as the River Windrush runs through the centre, is one of the most popular Cotswold villages. Attractions include a Model Railway, the Model Village, the Dragonfly Maze, Birdland Park & Gardens and the Cotswold Motoring Museum. STOW-ON-THE-WOLD ancient market town (31 miles) plays host to many festivals, craft fairs and a monthly Farmers’ market. The vast market square is surrounded by an elegant array of Cotswold stone townhouses, antique shops, tearooms, traditional pubs and award-winning restaurants. CHIPPING NORTON (32 miles) boasts a popular weekly market, numerous book and antique shops, many cafes, restaurants and pubs serving excellent food and local ales, art galleries, a museum and a thriving theatre. There are many walks and cycle trails from the town centre. The Uffington White Horse, Uffington (2 miles) is a huge chalk horse, 100m from nose to tail, carved into the hillside above Uffington. It is believed to be Britain’s oldest hillside carving and has sparked many legends. It is dated around 1000BC. Nearby is the Celtic earth ramparts of the Iron Age hill fort, Uffington Castle. Wayland’s Smithy (English Heritage), Ashbury (4.5 miles) is a large Stone Age burial mound. It is immersed in legends that Sr Walter Scott used in his novel ‘Kenilworth’. Great Coxwell Barn (National Trust), Great Coxwell, near Faringdon (6 miles) – a 13th century tithe barn built by the monks of Beaulieu Abbey in Hampshire. Crofton Beam Engines, Crofton Pumping Station, Crofton (22 miles). Wilton Windmill, Wilton (22 miles) is the only working windmill in Wessex and still produces wholemeal, stone-ground flour. There are special events throughout the year. Avebury Stone Circle, Avebury (National Trust/English Heritage) (22 miles). Long Barrow Chambered Tomb, West Kennet (27.5 miles). Silbury Hill Burial Mound (English Heritage), Beckhampton (28 miles). Ashdown House (National Trust), Lambourn, Newbury (8 miles). Buscot Park (National Trust), Faringdon (10 miles) is a late 18th-century house, set in enchanting landscaped grounds. Kelmscott Manor, Kelmscott (13 miles), a Jacobean country house and grounds. Lydiard House & Park, Lydiard Tregoze, Swindon (17 miles). Avebury Manor and Garden (National Trust), Avebury (26 miles). Highclere Castle, south of Newbury (26 miles). TV’s ‘Downton Abbey’, the castle only opens for 90 days a year and operates a very popular tour. Blenheim Palace, Woodstock (26.5 miles) a World Heritage Site often referred to as Britain’s greatest palace, and the birthplace of Sir Winston Churchill. Blenheim Palace has a full and exciting events calendar. The small babbling stream is all that separates your back garden from the public pathway and bridleways that link you to the picturesque village of Uffington and the Berkshire Downs, and some nice pub stops for you too! You’re also close to the National Trust Ridgeway for longer hikes. Faringdon Folly Tower and Woodland (7 miles) is an area of natural open space with a small fishing lake, picnic and park benches. Stanton Country Park, Stanton Fitzwarren (10 miles) is a 74-hectare country park and Local Nature Reserve. Chimney Meadows Nature Reserve, Bampton (12.5 miles). Coate Water Country Park, Marlborough Rd, Swindon (14 miles). A large 54 acre reservoir, wildlife reserve with bird hides and has plenty of other activities for the family to enjoy. There is a pitch and putt, splash park, play area, mini golf, miniature railway, cafe and more. Rushy Common Nature Reserve, Stanton Harcourt, Witney (16 miles). Barbury Castle Country Park (17 miles) is a Scheduled Ancient Monument, Local Nature Reserve, County Wildlife Site, Country Park and part of the North Wessex Downs Area of Outstanding Natural Beauty (AONB). A suggested walk is Barbury Castle and the Ridgeway. Cotswold Water Park (21 miles). Over forty square miles for sailing, windsurfing, canoeing and skiing and many miles of footpaths, cycleways and bridle paths. Savernake Forest (21 miles), with its abundance of wildlife and nature trails, is good for walks and picnics. The Oxfordshire Cotswolds is perfect for walking, cycling and has some of the prettiest and quietest stretches of the Thames, perfect for boating and fishing. The Cotswold Water Park (20 miles), an Area of Outstanding Natural Beauty, is made up of 140 lakes offering visitors a wide range of activities including boating, water skiing, fishing, cycling, walking, golf and horse riding. Some of the lakes along the Lower Windrush Valley are set aside for watersports and Hardwick Parks Watersport Centre (16 miles) and Linch Hill Leisure Park (15 miles) offer a variety of water based activities. The Cotswolds is criss-crossed with quiet country roads and lanes, as well as more challenging mountain biking terrain, making it perfect for all types of cycling. Faringdon Golf Course, Great Coxwell, Faringdon (5 miles). Carswell Golf and Country Club, Carswell, Faringdon (9 miles). Shrivenham Park Golf Course, Shrivenham (6 miles). Wrag Barn Golf and Country Club, Highworth (8 miles). Farmer Gow’s Activity Farm, Longcot, Faringdon (4 miles). Roves Farm, Sevenhampton (9 miles). Millets Farm Centre, Frilford (11.5 miles). Millets Falconry Centre, Millets Farm Centre, Frilford (12 miles) is home to over 80 birds of prey from tiny Owls to huge Eagles. STEAM – Museum of the Great Western Railway (14 miles) is housed in a beautifully restored Grade II railway building in the heart of the former Swindon railway works, located right next to the Swindon Designer Outlet. Didcot Railway Centre (15 miles) is home to the Great Western Society’s unique collection of steam engines, coaches, wagons, buildings and small relics. Crocodiles of the World, Brize Norton (17 miles). The UK’s only crocodile zoo. There are over 30 different species of animal including over 60 crocodiles. Wychwood Brewery Centre, Eagle Maltings, The Crofts, Witney (18 miles) run tours most Saturday and Sunday afternoons throughout the year. Minster Lovell Hall and Dovecote (English Heritage), Minster Lovell (18.5 miles). Cotswold Wildlife Park, Burford (19 miles). Mingle with Ruby and Ian, the parks famous rhinos, watch the penguin talk and feed, get up close and personal with the giraffes or view the oversized manes of the Asiatic lions. Combe Mill, Blenheim Palace Sawmill, Combe (25 miles). Oxford Bus Museum, Long Hanborough (24 miles). Big Batsford Christmas Hunt, Batsford Arboretum (36 miles). Christmas at Blenheim, Blenheim Palace (27 miles). Daffodil & Early Magnolia Month, Batsford Arboretum, Batsford Park, Moreton In Marsh (36 miles). Wilton Windmill open for guided tours & refreshments at 2pm, Wilton (22 miles). Crofton Pumping Station Steaming Weekend, Crofton (22 miles). Scruffs Dog Show, Cotswold Wildlife Park, Burford (19 miles). Lechlade Music Festival, Lechlade-on-Thames (11 miles). The Great Original Shirt Race, Bampton (16 miles). Half term activities, Avebury (National Trust) (26 miles) – children’s crafts and activities. 11am – 4pm. Blenheim Palace Food Festival, Blenheim Palace (26.5 miles). Morris Dancing, Bampton (16 miles). Chadlington Beer Festival, Chadlington (27 miles). World Pooh Championships, Langel Common, Witney (18 miles). Blenheim Palace Flower Show, Blenheim Palace (26.5 miles). Nocturne, Blenheim Palace, Woodstock (26.5 miles). Charlbury Beer Festival, Charlbury (25 miles). Kelmscott Summer Fete, Kelmscott Manor, Kelmscott (13 miles). The Cotswold Show & Food Festival, Cirencester Park (26 miles). Royal International Air Tattoo, Fairford (17 miles). Cornbury Music Festival, Great Tew Park, Chipping Norton (32 miles). The Marlborough Jazz Festival, Marlborough (18 miles). Battle Proms Picnic Concert, Blenheim Palace (26.5 miles). Newbury Waterways Festival, Victoria Park, Newbury (21 miles). Avebury summer of play, Avebury (National Trust) (26 miles). Rhino Month, Cotswold Wildlife Park, Burford (19 miles). Wilderness Festival, Charlbury (25 miles). Gloucestershire Vintage and Country Extravaganza, South Cerney Airfield, Cirencester (21.5 miles). White Horse Festival, Grove, near Wantage (9 miles). Oxford Proms, Sheldonian Theatre, Oxford (21 miles). Uffington White Horse Show, between Uffington & Fawler (1 mile). Donkey Derby, Bampton (16 miles). Blenheim Palace International Horse Trials, Blenheim Palace (26.5 miles). Northleach Steam & Vintage Show, Northleach (30 miles). Combe Mill in Steam – Country Crafts & Skills at Combe Mill, Blenheim Palace Sawmill, Combe (25 miles). Marlborough Literature Festival, Marlborough (18 miles). Combe Mill in Steam – Woodcrafts at Combe Mill, Blenheim Palace Sawmill, Combe (25 miles). Stow Horse Fair, Stow-on-the-Wold (31 miles). Marlborough Big & Little Mop Fairs, Marlborough (18 miles). Living Crafts for Christmas at Blenheim Palace (27 miles). A Night of a Thousand Candles, Woodstock (26.5 miles). Turn on of the town’s Christmas illuminations with music, candles, mulled wine, chestnuts etc. Cirencester Christmas Market, Cirencester old town centre (25 miles). Oxford Christmas Market, Oxford Castle (20 miles). Christmas Market at Combe Mill, Combe Mill, Blenheim Palace Sawmill, Combe (24 miles). Free admission.